When deciding whether or not to pursue orthodontic improvements, one of the most pressing concerns teenage and adults patient have is how their new braces will affect the appearance of their smile. For many people, the idea of wearing noticeable metal braces for months or even years is just too much of a hurdle, which is understandable to our Roselle Park Dental & Implants team. That’s why our doctors offer a quality alternative – Invisalign®. Invisalign treatment is convenient, comfortable, and virtually seamless! If you’d like to schedule a consultation here in Roselle Park, NJ, please contact our practice today. Instead of the traditional braces model, Invisalign features a series of clear, custom aligners that are crafted from high-quality plastic. Each specific aligner represents a different stage of your smile’s improvements, and the patient’s job is to wear them as directed and switch to the next one in their set at regular intervals (usually every couple of weeks). The total amount of aligners will differ between cases, but most patients can expect to wear about 20-29 overall. 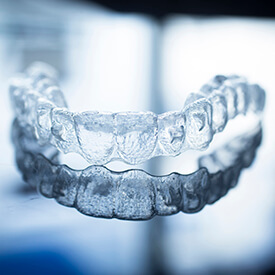 When worn, the clear plastic aligners have a pleasing and subtle appearance against your smile, which allows patients to maintain confidence throughout their treatment. They’re also removable, which means that you can continue to enjoy all of your favorite foods and brush and floss like normal. Overcrowding of certain teeth, which can increase the likelihood for tooth decay and periodontal disease. Large gaps between teeth caused by abnormal jaw growth or missing teeth. Crossbite, or when one or more upper teeth have a resting bite that falls within the lower row of teeth. Overbite, or when the upper teeth project further than the lower row of teeth. Underbite, or when the lower teeth project further than the upper row of teeth.